In the morning, Confederates observed four divisions of Burnside's IX Corps moving southward. Burnside's Corps was concentrating for an attack on the lower bridge. Protecting the bridge, in rifle pits overlooking it, were a few hundred Georgia men under Brig. Gen. Robert Toombs. 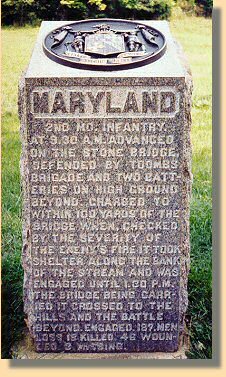 Beginning at 9 a.m. and continuing throughout the morning Burnside's men attempted to cross the bridge but were beaten back by Confederate fire. Burnside was apparently unaware that there were fords nearby which his men could have walked across. Eventually, Brig. Gen. Isaac Rodman's Union division, moving south, found Snavely's Ford and were able to cross the Antietam and attack the Confederate right flank. At the same time, Colonel George Crook's scouts located a ford several hundred yards north of the bridge and he sent a brigade across. Around 1 p.m. with attacks on both Confederate flanks, Burnside was able to send a column across the bridge and gain the other side. But it took two fateful hours for Burnside to reorganize his forces after taking the bridge. 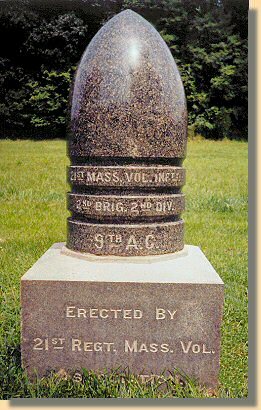 At approximately 3 p.m. the mighty Union Corps finally began moving toward Sharpsburg. Pushing back the small Confederate force facing them, Burnside's men encountered artillery that Lee had quickly moved from the North, but it only caused a short delay. They were just outside of Sharpsburg encountering little or no resistance. At this time, A.P. Hill's Division, which had been left at Harpers Ferry to process the prisoners and who had received an urgent message from Lee to come to Sharpsburg, arrived with five brigades on the Federal Flank. The resulting confusion drove the Federals back to the lower bridge. Although there were plenty of Union forces in reserve, McClellan discontinued the attacks. The next day (the 18th) the two exhausted armies stared at each other with no significant action. The Battle of Sharpsburg (or Antietam) is generally considered to be a draw, with Lee's forces checking the much larger Union army. 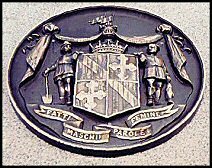 However, because of the battle's impact on the Confederate Strategy of invading the North and because Lee's forces eventually, on the night of the 18th, abandoned the battlefield, the Union declared a victory. On several occasions during the battle, McClellan's army could have destroyed Lee's Southern forces, but McClellan, true to character, hesitated. The South had been lucky having McClellan leading the Union army. Lee knew McClellan's character and it is hard to say to what extent he relied on McClellan's character in this battle. Lee was surprised by McClellan's initiative initially, but he was not aware that McClellan had a copy of his special order 191. It must be assumed that Lee kept the Confederate army on the battlefield all day on the 18th because he believed McClellan would not attack and to show that he had not been driven from the field. That night the Confederates moved out. On October 1, 1862, President Lincoln arrived at Sharpsburg unexpectedly and spent four days reviewing the troops, touring the battlefields, and visiting hospitals. He also spent some time conferring with McClellan. Early one morning during his visit he and an acquaintance from Illinois, Ozias M. Hatch, walked up to some high ground that overlooked the encampment of a large part of the army. As they gazed at the vast sea of tents spread out below, Lincoln suddenly asked, "Do you know what this is?" "It is the Army of the Potomac," Hatch replied in some puzzlement. "So it is called," Lincoln said, "but that is a mistake; it is only McClellan's bodyguard."